Opposition wants Rajya Sabha to condole 'demonitisation-linked' deaths of nearly 70 people. Will it? Rajya Sabha was disrupted for the third straight day on 21 November as the Opposition found a new issue to corner the Narendra Modi government over. Chairman Hamid Ansari began the day's proceedings by condoling the loss of nearly 130 lives in the Kanpur train accident. Soon after, Opposition MPs rose to their feet demanding that condolences be similarly read out for the nearly 70 people who have allegedly died waiting outside banks and ATMs - a consequence of demonitisation. CPI(M) General Secretary Sitaram Yechury raised the demand and he was backed by BSP chief Mayawati and Leader of the Opposition Ghulam Nabi Azad, among others. Deputy Chairman PJ Kurien, who was presiding over the proceedings, seemed baffled by the suggestion, as it is rare for MPs to ask for obituaries, which usually come suo motu from the Chair. The move was clearly designed to frustrate the government. Indeed Leader of the House Arun Jaitley appeared to recognise as much saying the Opposition wasn't ready for a debate and was merely trying new tactics every day to disrupt Parliament. Since last week, the Opposition has been protesting against Prime Minister Modi's absence from the House, and demanding that he come and listen to the MPs' observations on the fallout of his demonetisation decision. On Monday, it raised two new issues. One, obituary reference on behalf of the House to the deaths of nearly 70 people allegedly because of demonetisation. Such a reference would be tantamount to the government accepting that these deaths were a result of demonetisation. Also Read: Kejriwal & Mamata sound demonetisation war cry: "Modi is PM of the rich"
Two, the absence of Railways Minister Suresh Prabhu from the House. The Opposition MPs demanded that the minister give a statement on the Kanpur tragedy in the House. Prabhu's deputy Rajan Gohain did stand up to read out a statement, but the Opposition MPs protested, demanding that Prabhu come to the House himself. They sought to convey that this showed the Modi regime's "lack of seriousness" towards the tragedy as well as towards the Upper House. The highlight of the day was when several Opposition MPs rushed into the well of the House and raised slogans targeting the prime minister. 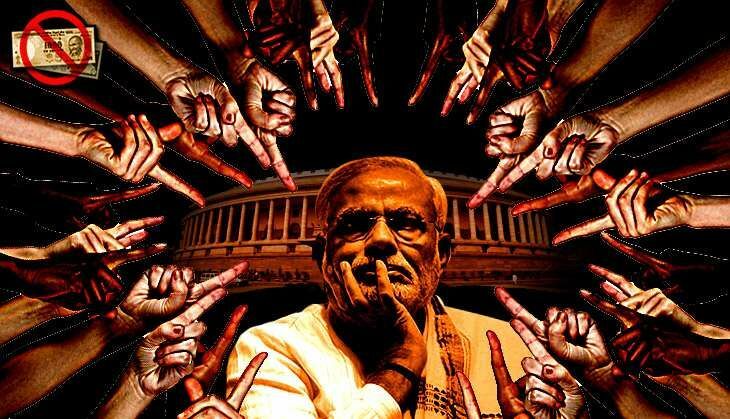 As Kurien appealed for calm, the protesting MPs kept shouting, "Gali gali me shor hai, Narendra Modi chor hai!" While it's not uncommon for the Opposition to attack the prime minister directly inside Parliament, to unabashedly call him a thief is rare. That it happened - even if not as part of the official proceedings - only serves to indicate that the Opposition has decided to up the ante against Modi. It will be interesting to see if Modi will continue to avoid the Rajya Sabha, or he'll agree to a debate on demonetisation and its impact.